The Bears are in town as the Phantoms try to avenge Sunday’s loss in Hershey, despite depleted ranks. After a hot start to 2015, the Phantoms have dropped 2 of their last three over the busy 3-in-3 weekend. Still, with struggles up in the Wyoming Valley, the Bears have taken over first place and the Phantoms are within easy striking distance. A 5-2 loss at the Giant Center against Hershey Sunday followed a fabulous 5-1 win at the PPL Center Saturday Night versus the Senators. Friday night was a narrow loss at home versus the Devils. The Saturday game featured the first PPL Center Hat Trick–by any team–for Phantom Nick Cousins. We’re exactly at the half-way point for the 2014-2015 Phantoms. They remain in third place, one standings point behind the Pens and four behind the Bears. The Phantoms have “games in hand” (or, season games yet to play) on both teams. In addition, including tonight, there are six more head-to-head games versus the Bears and seven versus the Pens. In any case, there’s a lot of hockey to play, and it’s nice to see our team is competitive at this juncture. 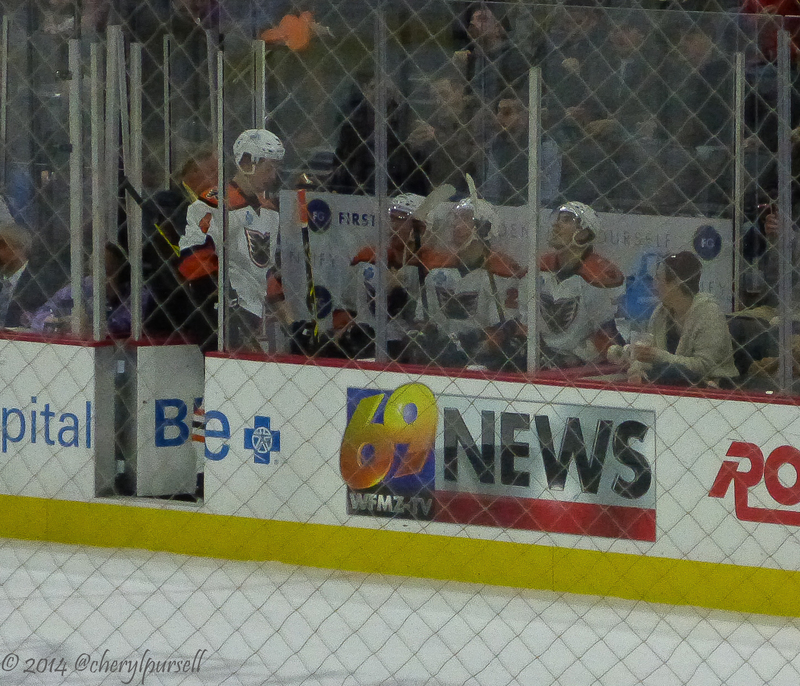 The Phantoms lead all of the AHL in both total penalty minutes as well as penalty minutes per game. And it’s not close. Def Brandon Manning and Oliver Lauridsen were called to Philly to help the Flyers’ ailing blue line for last night’s brawl with the Penguins. I believe Laury was a scratch, and I’m not sure how much ice time Manning got. In any case, reports are that both players will be back in Allentown for tonight’s game as the NHL heads to All Star Break. Jesper Pettersson has been a healthy scratch of late, and could be called upon to step up for our defense. Robert Hagg has been playing well since his return from World Juniors. However, he was deemed “not ready” at this point for his NHL debut. Goalie Rob “The Mighty” Zepp remains in Philadelphia with the Flyers, and has played well. I’d expect to see Anthony Stolarz in goal again tonight. He just faced the Bears and does better at home. Jason Akeson remains with the Flyers as we await Scott Laughton’s progression through the concussion protocol. Nick Cousins narrowly missed gaining “Player of the Week” honors for the AHL. A mistake, in my opinion. Darroll Powe remains an injury scratch, of late. Tickets: Good seats still remain as of this writing, including single seats as close as the second row, and club-section seats. Parking: If you’ve been one of the lucky ones who have been able to park in the arena facility at the Linden Street entrance, please have a back-up plan. The Renaissance Hotel is now open and much of that facility is now under reservation for the hotel–even if it’s not used. We’ll see if they fine-tune this going forward. For those who require accessible parking, please let me know if your options have been impacted with this change–I’ve heard bad things. Weather: There may be snow in the area as game-time approaches. I am 99.44% certain the game will be played. We will update for any changes. The last snowy game, I found the lots and streets plowed and treated downtown; however, they were a little tardy with the sidewalks. Choose your footwear wisely if you’re going to be early–and leave a little extra time overall. Promotion: Happy Hour! I’ve been having fun with this, but it is a rather good deal: $2 Coors Light at the Coors Light bar behind section 108. From gates opening through at least the first intermission. The line tends to move quickly, so take advantage if you like. Broadcast: If you cannot come out to the game, you can catch it on TV-2 if you are a Service Electric Subscriber, or via the AHL package if you’ve ante’d up for such, online. The radio broadcast is available on AM-1470 or online at the corresponding IHeartRadio.com station. In the arena, use FM-89.9 for the live call. Watch to see if the Flyers return a defenceman in advance of the game. Otherwise we’ll play with what we have or get support from Reading. Some kind of transaction should come through today. Watch to see if Stolarz is in the goal, and how he performs against the Bears, whom he’s done well against at home in the past. Watch to see people coming back to their seats late because they were in line for Coors Light. Watch to see where Taylor Leier is playing. Coach Murray has had him up and down the lines, and switching from left to right and back again. We’ll need some scoring from him tonight against the AHL’s best scoring defense. Watch to see how Jesper Pettersson does on defense after having scratched so much of late–or if he even plays. Watch for meLVin–he’s supposed to have a “special guest” tonight. Saturday January 24: St Johns is in town, and we’ll be getting more orange shirts! It’s “Inaugural Season Night” with a T-Shirt giveaway for all fans with seats and who are size XL. The players will be wearing special “Inaugural Season” jerseys which will be auctioned off at the conclusion of the game. Stay tuned for details. Thursday January 29: You say you haven’t been to a game yet? 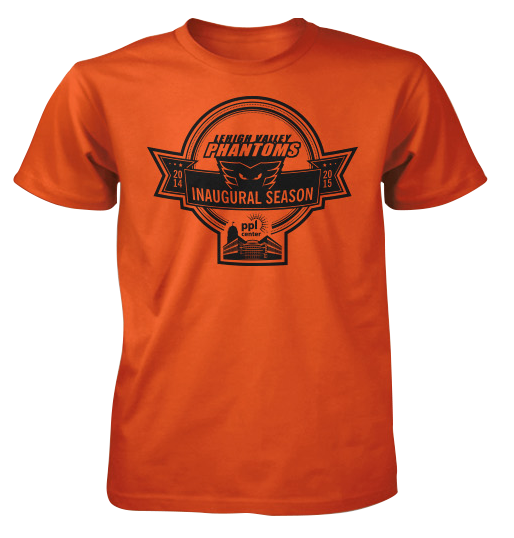 Well, the Phantoms Phan Club–the “Phan Nation”–and your friends here at the Horn and Bell Blog have you covered. A limited number of $12 seats remain if you’re interested in testing out a game. And it’s the Devils! Who doesn’t hate the Devils, right? Get in touch with me: Kramof209(at)gmail.com for details. Section 202–normally $25.50/$26.50 with fees–and there’s not a bad seat in the house! This is a limited opportunity for this one game only–the response has been amazing! Big thanks to the Phan Nation and to the Phantoms Ticket Office for help with this project! Friday January 30: Kids jersey night for the first (how many?) kids 14 and under. More details to come, but note that this is a more limited giveaway than they’ve done thus far this season. And, it’s the Hershey Bears again! Manning got lots of ice time last night vs the Pens. Just saw that both players were loaned to the Phantoms.